What is Showdown? Sport Club for Integration (S.C.I.) "Vitosha"
Vitosha Sports Club for Integration started developing a brand new sport in our country called showdown. The Showdown sport is extremely interesting and exciting. Showdown. Showdown is a fast-moving sport originally designed for people with a visual impairment, but you don´t have to be blind to play! Sometimes it is mistakenly referred to as table tennis for the blind because it is a table game. However, it does not have courts marked on the table therefore points are scored by hitting the ball into a goal pocket. Sighted people and those with disabling conditions other than blindness find this game challenging. History. Joe Lewis, a totally blind Canadian, invented the game in the 1960´s. He wanted to find a sport which could be played recreationally and/or competitively without sighted assistance. Over the years, Patrick York, a Canadian athlete who is also totally blind, collaborated with Lewis on refinements to the rules and equipment. 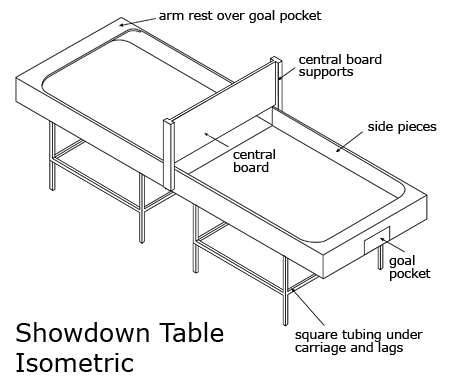 Showdown was an international success at its debut as a recreational sport during the 1980 Olympiad for the Physically Disabled in Arnhem, Holland. International interest was sparked and showdown has been played recreationally at the: 1984 Olympics for the Disabled in Long Island, USA; 1988 Paralympic Games in Seoul, Korea; 1990 World Youth Games in St. Etienne, France; 1990 World Championships in Assen, The Netherlands; 1992 Paralympic Games in Barcelona, Spain; and most recently at the 1996 Paralympic Games in Atlanta, USA. Equipment. The sport is inexpensive to start up, requires minimal maintenance, and can be played in a room the size of a classroom or meeting room. A size of a room 6x4 meters would be sufficient. The only equipment needed is a specially designed table, two paddles, a special ball into which metal bee bees have been inserted, and perhaps a glove for the batting hand. Sound produced by the bee bees rolling around inside the ball indicates the location of the ball during the play. The game. Showdown is easy to learn. The object of the game is to bat the ball off the side wall, along the table, under the centre screen, and into the opponent´s goal. The first player to reach eleven points, leading by two or more points, is the winner in the set/game. Two points are awarded for a goal and one point is awarded to the opponent of the player who hits the ball into the centreboard screen, causes the ball to leave the playing area of the table or touches the ball with anything other than the bat or batting hand (no more than 6 cm past the wrist joint). Around the world. Showdown is played in countries throughout Europe, Africa, Asia and North and South America. After the success of showdown at the 1996 Atlanta Paralympics, representatives from more than thirty countries contacted the International Blind Sports Federation Showdown Subcommittee. They wanted information about equipment, blueprints, and rules so they can play this game in their country. Currently, the IBSA Showdown Sub-committee is encouraging regional and national showdown tournaments in an effort to have international championships which, hopefully, will lead to sanctioning by the Paralympics. European as well as World championships have already been regularly organized. In 2008 a showdown European championship took place as well as a World Championship in 2009. In Bulgaria. Members of Vitosha Sports Club for Integration got the chance to learn about the sport in Hungary at the end of 2008. Again in Hungary, contacts were established with a Swedish showdown specialist who engaged himself in helping Vitosha to buy a showdown table. After a long period of correspondence, which lasted more than half a year, Bulgarians managed to provide money for the table. But again they had to wait for some months, until the table was delivered to Bulgaria. The first Bulgarian showdown table arrived from Sweden on November 17th 2009. During the first week after that two demonstrations were organized outside the club office. The great interest towards the new sport is obvious. In relation to the development of showdown in Bulgaria, Vitosha Sports Club for Integration translated the IBSA Showdown Rules and accepts them.